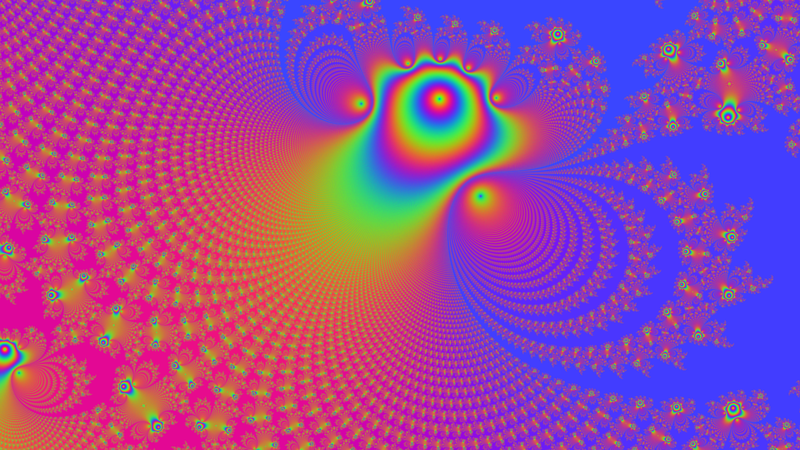 The images on this page were all generated from the Mandelbrot set using a program I wrote. The Mandelbrot Set is probably the most famous fractal. Mandelbrot images are generated using an iterative function applied to the coordinates of each pixel in the image. The color for each pixel is simply chosen according to the number of iterations the function required to finish. Points are either in the set or not as decided by the function. Points determined to be in the set are typically colored black. For the first set of images below, I used a fairly generic implementation of a Mandelbrot generator except for an original contribution I developed which allocates colors to ranges of exit values in proportion to the amount of area they cover. It uses a histogram equalization technique to allocate more colors in larger regions at the expense of smaller regions where liberal allocation would be mostly wasted. This brings out the smooth and subtle gradations which other similar programs often loose. Best of all this allocation is done completely automatically working quite well even when there are enormous ranges in the magnitude and distribution of exit values. The Mandelbrot Set is an excellent example of superliminosity since every colored pixel represents a point that proved to be outside the limits of the Mandelbrot Set, and the displayed color represents just how far from that limit it is. This one is perhaps my favorite since I feel that it has a very good balance of complexity, smoothness and variation. Note that the choice of colors in the pallet is independent from the algorithm that maps them to ranges of exit values and that the pallet can easily be manipulated after the image is produced. The particular color map I used with all the images on this page is admittedly garish and any artist should have no problem improving on it. I choose it simply because it gave a wide variation in hue. This one is particularly disturbing being somewhat reminiscent of a brain or embryo or other organic form. This one is from a particularly deep zoom where the computer's floating point precision is beginning to run out with the loss of resolution resulting in rectangular blocks of pixels. This is a fairly typical Mandelbrot image from the "Valley of Seahorses" region. The coordinates for this image was taken from the book "Chaos". You can see another rendering of this region by Walter Brameld IV kindly generated a really high resolution version that I could have printed on canvas my mother's birthday. Here is a medium resolution version of the resulting image. Another person who goes only by the name The Almighty Pegasus Epsilon created this lovely render of the region. To see my contributions to fractal methods can be found here. 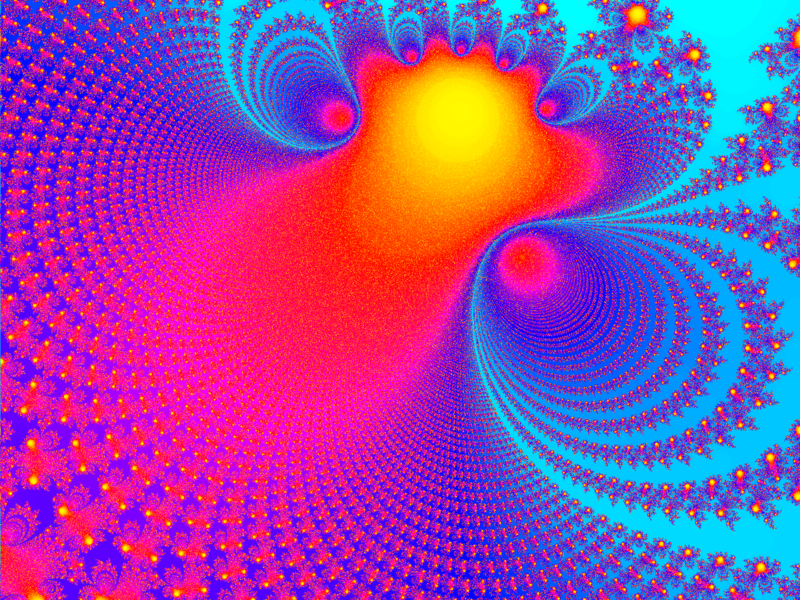 A beautiful freeware real-time Mandelbrot zoomer can be found at XoaS Software. You may also enjoy viewing Dan Freeman's fractal gallery that he too created with his own custom software. 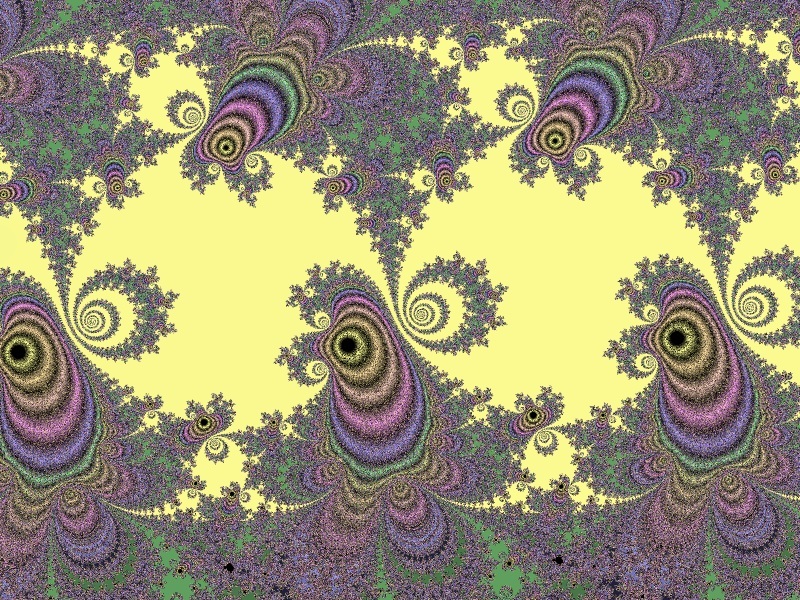 Here is a lovely Mandelbrot atlas at miquel.com to help guide you on your own explorations of this strange world. Be safe, have fun, take pictures, and mabe send me a postcard if you feel like it.